This pack of Ready to Use SMARTboard files can be used as a self checking math station during your math rotations. The files are grouped so that you can open the set of numbers the math group needs to work with. The SMART Notebook files are grouped as follows. Each set is one SMARTbook file with the listed pages. 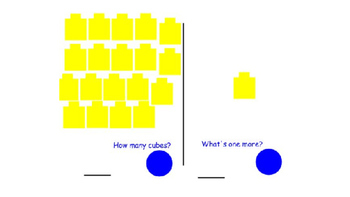 The student will count the cubes on the left and write the number in the blank. 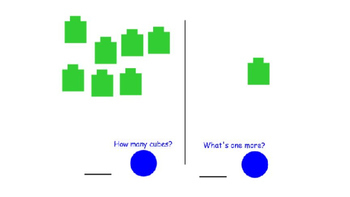 Next, the student will click the blue circle to reveal the number of cubes. 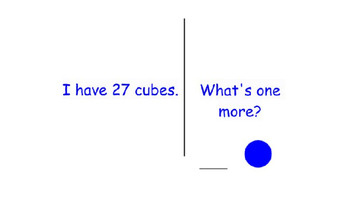 On the right side, the student will write how many more cubes there are with one more. Again, the student will click the blue circle and reveal the answer. Cubes are not included with sets 3-6. 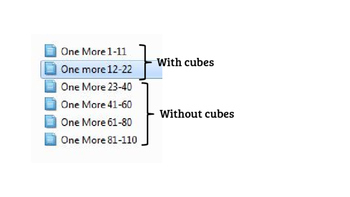 The left side of the page states how many cubes there are, and the student is only required to write how many it is with 1 more. See the preview for images of the pages. I love making educational resources and am always happy to make a custom resource to align with your curriculum and meet the needs of your students. Don't hesitate to reach out if you have a request. You can ask a question on an item or reach me via email at katie.tulloss at gmail.com. Purchasing this product grants permission for use by one teacher in his or her own classroom. If you intend to share with others, please purchase an additional license. Multi-use licenses are also available on TpT.